Why does the sun look flat near the horizon? I saw a photo of the sun rising above Lake Michigan. Why does sun appear flat? 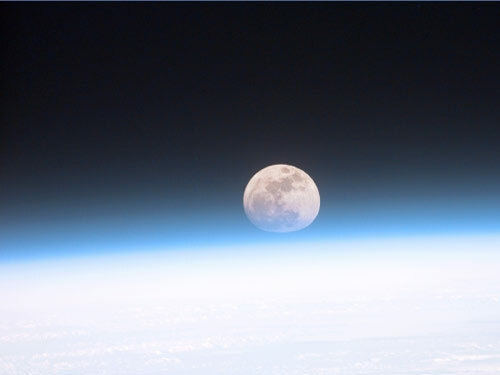 Photo of moon partially obscured by earth’s atmosphere: NASA. The distortion of the moon’s lower section is caused by refraction. This flattening of the sun on the horizon is an example of a mirage. Mirages are not illusions; they are images formed as light bends on its passage through the atmosphere. This bending, called refraction, explains many everyday phenomena. For example, refraction causes objects partly immersed in water (such as a straw in a glass of water) to look bent. Refraction depends on changes in optical properties along a light ray’s path to your eye. Because the optical density for air and water are different, a ray of light moving through air and water will bend. The optical density of air is a function of temperature. So, as air passes through layers of the atmosphere with different temperatures, it bends the light. The atmosphere, particularly in the early morning, usually has a layered structure; air temperature changes with height. If the sun is on, or just above the horizon, the light travels along a long path through the atmosphere. As the light passes through these different layers, it will refract and deform, flatten or distort the sun’s disk. Light rays coming from the top of the sun bend less than rays coming from the bottom, slightly squashing the sun’s circular shape. Steven A. Ackerman and Jonathan Martin are professors in the Department of Atmospheric and Oceanic Sciences at UW-Madison, are guests on the Larry Meiller‘s WHA-AM radio show the last Monday of each month at 11:45 a.m.